Bored of the cold weather? Yeah, we’re pretty sick of it too! Although it’s pretty rare for people to be taking summer holidays in the middle of winter, we’re going to try our best regardless! 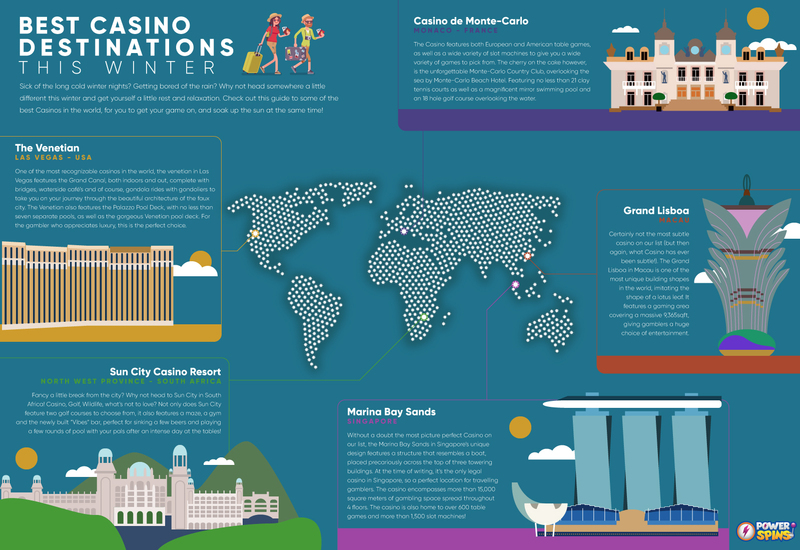 We’ve teamed up with the folks over at Power Spins to bring you this awesome travel guide that gives you a few hot locations to check out across the globe this winter. Fancy a few rounds of golf just in time for Christmas? Why not head to the incredible Sun City in South Africa. Not only does it have no less than four luxury hotels to choose from, it’s also home to the highly regarded Lost City Golf Course, which offers a 72-par, 18-hole desert-style course that incorporates twenty eight thousand square metres of water features and includes a water hazard at Hole 13 which is home to 38 live Nile crocodiles. The Gary Player Golf Course, designed by none other than the legendary namesake Gary Player is an 18-hole par-72 walking-only championship course that is regularly ranked as one of the leading golf courses in South Africa. Sun City is home to 7 incredible bars and, wait for it, 27 restaurants! You could eat somewhere different every night for three and a half weeks and never eat at the same place twice. Not bad eh? Let us know if this prompted you to try anywhere new, and be sure to share it with your friends!